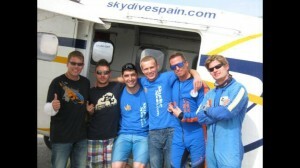 During our stay at Skydive Spain, Seville in October, we also held a USPA AFF Instructor Course. This course requires more days, more preparation and more training, buth both participants came well prepared and completed the course successfully! We congratulate the two Romanians Andrei Machedon and Richard Gecse for their new USPA AFF-I Ratings! Well done and best of luck for you for the upcoming student jumps!